Germany moves into a new era. Digitization is no longer just a buzzword. While a few years ago industry reacted rather cautiously to the Digitalization trend and concentrated entirely on production, the Digitalization of processes in the area of maintenance and service has now virtually exploded. Accordingly, a considerable number of different solutions for this area have been developed in the meantime. Even though the term 'predictive maintenance' is heavily used here, the different approaches have a common goal: the open exchange and transfer of information to the next process without media discontinuity. Isolated solutions and proprietary systems are "out". The data collected from machines can now be transferred to a wide variety of applications and systems. For example, in order to develop algorithms in addition to data evaluation that predict very precisely when a malfunction could occur in the system. This creates the conditions for optimizing maintenance processes in a revolutionary way. Humans remain at the end of the information flow, making decisions about the following actions and assuming responsibility. 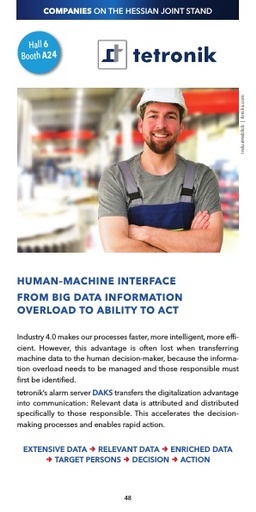 Even if Digitalization makes our processes faster, more intelligent and more efficient, this advantage is often lost when transferring machine data to the human decision-maker. The flood of data quickly becomes too overwhelming to react to: Because data must be assigned correctly and those responsible must often first be found. 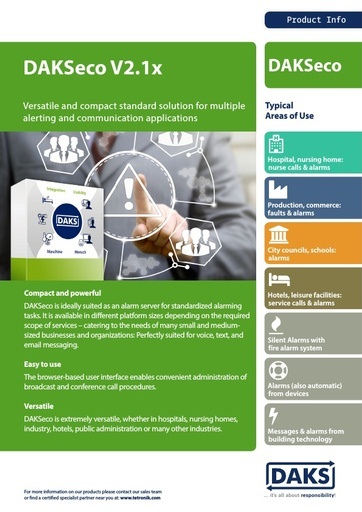 It is precisely at this critical point that the tetronik alarm server DAKS comes to action and transfers the Digitalization advantage into communication: Relevant data is identified, attributed and immediately distributed to those responsible. This accelerates decision-making processes and enables rapid action. Bring relevant and informative data to those responsible and help them to make good decisions: This is the current task to which we continue to devote ourselves with the greatest conscientiousness.